Ahhhh…the perfect start to a Saturday morning includes sleeping in, waking up to sunshine, a run and an awesome breakfast. Today is going to be another 80 degree sunny day and we are getting ready to head out for our fun day soon. 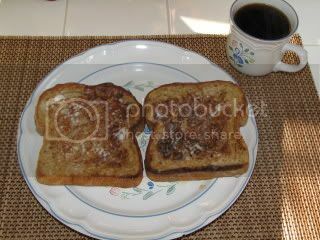 For breakfast I decided to use our Gillwood’s Honey Wheat Bread to make up some delicious French Toast. Dunk your bread in the above mixture and brown in a nonstick pan or a pan sprayed with nonstick cookie spray over medium heat. Top with your favorite toppings – whipped butter, maple syrup, fruit, nuts, etc. I made two slices for each of us with our gigantic bread. Served up with some Decaf Cinnamon Vanilla Nut decaf coffee ~ Yum! I normally would top my french toast with some fruit, but, the only thing we have left right now is cuties. Somehow that didn’t seem to fit in the mix. So I used about 2 teaspoons of Whipped Butter and a drizzle of Pure Maple Syrup (about 1-2 tsps) on each slice. Have a great Saturday all! Enjoy the sunshine if you have it but more importantly make sure you have some fun today! See you all when we return back from our journey. 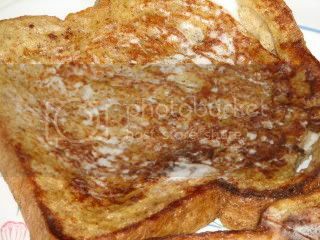 Ooohhh, the french toast looks great! Emily ~ It was super tasty, I forgot how much I missed French Toast. LuckyTasteBuds ~ That was such a sweet compliment – thanks so much and be sure to check back often for more ideas.